Steve Jobs wanted to do for education what he did for music, phones and tablet computers. 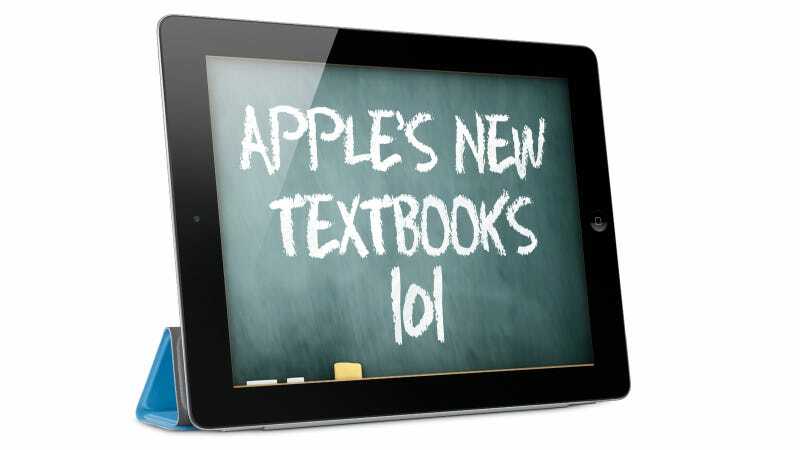 Apple's new textbooks was his Next Big Thing (or one of them). With their new iBooks 2 and iTunes U app's digital courses, Apple wants to change the way students access education material and help them learn and study. But have they succeeded? Is it really an education revolution? iBooks 2 is not a revolution, something that Schiller was careful to highlight at the beginning of his presentation. Apple thinks the education system needs a reset. But they think they can help, with iBooks 2 and iBooks Author—a combination that they hope will replace physical books, which are too big and heavy, quickly obsolete and lack interactivity, a word that is often empty in this industry, but has true meaning in this case, as we will see later. On this front they have succeeded. iBooks 2 is great, especially if you have the iPad 2 (on the iPad 1 they can get slow sometimes). Apple's new iBooks are as impressive as they said in the presentation. They are beautifully crafted. Their use of videos, timelines, animations, embedded presentations, integrated review questions and quizzes and their highlighting and study card system are extremely good. They work and they are enjoyable. Unfortunately, they are not perfect. The lack of sharing features is a major killer with actual school work, in which collaboration is a must. Right now there's no way to share your highlighted text with others. You can only share your notes. I can't export it all to a file so I can work from my notes and highlighted text in the computer, something that would be useful to everyone, not only students. All my digital books are highlighted and have notes, so I really want to have this feature. Apple's biggest strength in the whole iBooks 2 proposition is not the book themselves. It is how easily they are created using their iBook Author application. This development tool is free and it's so drag-and-drop easy that it can be used by anyone. It has the potential of truly democratizing the publication of advanced books which, in a way, act like applications. Thumbnail index: You're able to go through books using a visual index, with thumbnails marking the sections of the book, along with a text line-up. This is not particularly necessary, but it's a good way to present content. You can easily go through chapters and sections sweeping with your finger on the main index page. I wish there was a more detailed index page, however (my guess is that more complex books will use them). Built-in videos: The video support is straightforward. Click and play. Text flows around them as if they were images, completely integrated in the layout. You only need to tap on them or pinch out to expand them into full screen. This is especially satisfying, as you zoom in and out of them as you would do with images in the photo album application. Interactive animations: The new textbooks—and any book made with iBook Author—would be able to use interactive animations. In fact, these animations can be created on Keynote, which makes it incredibly easy to add this content. These animations work like the videos and images: you can expand them easily by pinching out on them or just tapping on them. They are marked as animations as you tap on them the first time. On this image you can see how it looks as I pinched to zoom. Study cards: This is another really neat feature, perhaps one of the best. The iBooks app will automatically turn your highlights and notes into study cards. The cards will also include must-lear words from the glossary. They follow a paper metaphor, complete with a 3D effect (shown in the first image). Their objective is to make these cards feel like actual library cards. Like real cards, you have a basic concept on the front and expanded notes on the back. Like every other element in the iBooks app, sweeping your finger will go through all of them. You can also flip them around easily, by clicking on the lower corner. It's a good translation of the real world, a user experience that is both useful and looks elegant. It will also be useful for any kinds of research, if it's available for every book through the iBooks 2 application. The glossary is always accessible from the top of the screen, one click away. It's well organized, very clean and without any adorns or clutter. You can navigate using the alphabet on the left side of the screen or just scrolling down. As you would expect, you can jump to any part of the book where the word is mentioned. Quizzes and review questions: Another cool feature that I'm sure students will love are the instant quizzes built-in into the textbooks. The quizzes and review questions are built right into each book, at the end of each chapter. They are pretty straightforward questions with multiple-choice answers. Pick the one you think it's correct and click on the reveal answer button to see if you were right. There is no scoring, however. It would be neat to have some scoring system on more complex quizzes and built-in exams, set by the teacher. This seems like it could be a winner for everyone, not only big publishing companies. The app will be free, and it's available today at the Mac App Store. If these new books take off, it will be because of iBook Author, not just because of the books themselves. This tool will have deep consequences for anyone who wants to publish a book that goes beyond the classic electronic book. It actually opens an opportunity for people who are not developers, to create book "apps" without writing a single line of code and using off-the-shelf apps like Write, Keynote, Word, iMovie or Photoshop. Unfortunately, it's available for Lion only. iBooks 2—or Apple-media-rich-books-1.0—is good. Very good. iBooks Author will be an awesome tool to make great textbooks, easy to update and at a good price. And normal books too. I just wish they had more collaborative features, something that is crucial for both learning and research. Sharing highlights and notes in in a social network is a must. I hope Apple gets it right for iBooks 2.5 or 3, but looking at their Ping flustercuck and complete lack of social networking savvy, I'm not holding my breath.